Well, in the category of news we never thought we'd live to see, The Finland Board of Film Classification has given an "R" rating to American television's Little House on the Prairie. Obviously, the American version of the famously wholesome series was heavily censored and they were just saving all the risque and violent stuff for their jaded European audience. * We did some investigating** and discovered the following seamy and controversial material had been left out of the original U.S. broadcast run of the series. All I can say is, prepare to be shocked... shocked, I tell you. Mary and Laura were meth addicts. They tried to switch to crack in one of the "lost" episodes (Episode 143: Little Crack House on the Prairie) but switched back to meth in another "lost" episode (Epsiode 147: Back to the Old Smack). In a bizarre cross-over episode, which mistakenly aired on PBS as an editon of Frontline, Grizzly Adams appears, and his bear, Ben (named after the famous rat), savages Mrs. Whipple (Episode 104: A Grizzly Discovery). Bunny the horse was a serial killer (Episode 48.5: Horsin' Around, Episode 49.25: Bugsin' Bunny) and killed several snake-oil salesmen, swindlers, and horse thieves. Due to the unsavory nature of the victims and Bunny's sunny personality, these killings were overlooked. However, Bunny goes too far when he tries to assassinate Pope Pius X (Episode 49.75: Payin' the Pius Piper), who is in Minnesota checking out the lakes. Bunny's plan falls apart when Pope Pius X uses his horse whispering ability to trick the horse into attacking a large rhododendron instead. Pope Pius X then subdues the horse with judo. The episode is generally not considered to be historically accurate, as Pope Leo XIII was actually in pontifical office during the timeframe of the series, and also as Pope Pius X was well-known to be a practicioner of aikido. 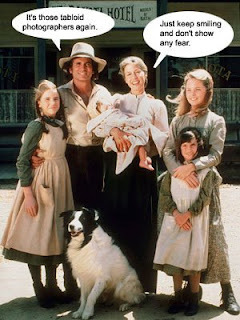 Charles and Caroline Ingalls were swingers. This would have been a bigger deal, but out on the prairie there aren't exactly a lot of couples to pick from. Still, there's "lost" episode 68 (Swingin on the Prairie), "lost" episode 132 (Prairie Dogs of Lust), "lost" episode 155 (The Olesons Again? ), and "lost" episode 187 (A Wild Hayride), which accidentally ran on NBC in 1979 and was mistaken by millions of viewers for an episode of M.A.S.H. (Episode 492: The Hot Lips and Klinger Mix-up). Nels Oleson actually did behead Mrs. Oleson in Episode 50: The Monster of Walnut Grove. In the American-aired version, it turns out that he accidentally beheaded a mannequin. In the uncut version, he beheads Mrs. Oleson, but being an evil %&$#! her head crawls back and reattaches itself to her body, explaining her reappearance at the end of the episode. Notice though that she is wearing a very high collar to mask the scars. Bunny the horse was not shot by Charles in the uncut version of the show. He was put on trial and hanged from the gallows for his many murders. ("lost" Episode 52.75: Bunny Swings). In the version reshot for American audiences, Charles shoots Bunny, but even then you can see Michael Landon mouth the words, "Now you'll pay, you murdering jackal!" right before he caps Bunny. A large portion of the town of Walnut Grove are killed in a freak blimp accident (Episode 188: Big Round Gassy Death from the Skies). * It's hard to believe. What's next, Anne of Green Gables turns out to be Juila Roberts roommate in Pretty Woman? **** This is a completely unnecessary footnote. Following up on the Dora the Explorer post a few days (weeks? months?) ago... for some strange reason, the show was on the other morning at home, and believe it or not, Dora actually jumped a shark in a boat. No, I'm not just having a laugh. She jumped the thing in her little cartoon boat. Her pet orangutan Bosephus (or "Boots" for short) was along for the ride. However, Dora then blew up the shark into chum with a torpedo, so there's hope for the loud** little tyke yet. * They were wrong, of course. ** I'm not kidding. She may be Billy Mays child.